Follow my link to Scrappin' Cecile's blog. She is giving away some super cute blog candy this week! She has an Etsy shop and sells her creative masterpieces over there! Go take a peek and leave her a comment to enter! She is also giving away a surprise pack of scrappy goodies! So what are you waiting for? GO! After a weekend of cat posts, I am thinking it is time for something a bit more substantial. Bear with me here.....you will like this! A few days ago I was in the kitchen mixing up a poundcake. I had the radio on to my favorite local station, and I was singing along to most of the songs. (You will be thankful that I was indeed home alone at the time) Since I am such a nerd I listen to a local channel that plays the stuff I grew up with or wish I had grown up with...music from the 60s, 70s and 80s. A song came on that I did not recognize so I went on listening as I mixed and measured. The lyrics caught my ear... "Only love can break your heart". My first thought was how sad that was, that the only love this person had known was heartbreak. Then God laid something a little deeper on my heart. What the artist was saying is true....but it is only GOD'S LOVE that can truly break our heart and change us for the BETTER! Take for example Psalm 51:10. It says "Create in me a clean heart O God". We know that we are born with sin nature. The only way that God can create a new heart in us is to supernaturally change our heart, or even make a new one. Dictionary.com lists the meaning of "create" as "to cause to come into being". This can only be done if the old heart is out of the way, correct? It also lists the meaning of the word "break" as to make a way through, to divide in parts, to reduce to fragments". Doesn't take a rocket scientist then to understand that when God breaks our heart, He will make a way through it and then can create something new in it's place, correct? Read on into Psalm 51:17 which says "My sacrifice to God is a broken and contrite heart (broken down with sorrow for sin and humbly and thoroughly penitent) Such, O God, You will not despise." In Psalm 119:20 David cries out to God, saying "My heart is breaking with the longing it has for you....at all times"
Now that is the kind of heart I want! 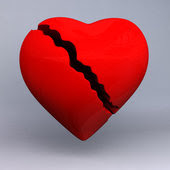 A broken heart???? Yes! Broken before God, open, wanting something new, longing for God to create a new thing, asking God to create in a me a clean, pure, willing servant's heart, ready to do His will and give Him all the glory! When Neil Young sang his song, I am sure he had another meaning in mind, but leave e alone with God in my kitchen and He will give e a deeper meaning to share with you! "Only Love Can Break Your Heart"- Neil Young, from the album "After the Goldrush"
produced in 1970 under the label Reprise. I am happy to report that I was able to get some antibiotics for Loudmouth and she is doing much better! The abscess seems to be healing quite well and the swelling is much reduced! My precious kitty Loudmouth has an abscess on her right cheek. Poor kitty! We are treating it with peroxide and neosporin, and trying to locate some antibiotic of her. With Jamie working sporatically, a visit to the vet is not possible right now, so I called my pal Heather who co-owned a vet clinic in California with her husband. She dropped by to look at Loudmouth last night and recommended using Amoxicillin. You can buy Amoxicillin over the counter for fish, under the name Fish Mox or Aquaticure. It is 250mg capsules and she needs two a day. I have been on the phone all morning trying to locate the medicine, and no one in Savannah sells this stuff. How annoying! I can order through Amazon.com, but it will be a week getting here. Mental note to self: as mom to 3 cats, order some to have on hand. I just got a call from Stephanie, she may have a lead....I will keep you posted! Hi folks, scurry over to my other blog, "I'm Not Cheap, I'm Thrifty" and check out the post about Earth Day deals that are good today only!!!! Don't wait...scamper on over! GO JENN............RUN LIKE THE WIND! WOO HOO! We have had internet issues today so I have not be able to post until now. My 22 year old niece completed the Boston Marathon today in 3 hours and 26 minutes. We are so proud of her!!!!! Hey everyone! Guess what? My niece Jennifer is running in the Boston Marathon today! Her goal is to finish in under 3 1/2 hours. She started in the second wave of runners and is currently running a mile in about 7 1/2 minutes. She is doing very well, and her estimated finish time is 3 hours 22 minutes. GO JENNIFER! We are so proud of you!!! You know how you will just be driving along and you will see something out of the corner of your eye that makes you say "HUH???" Well, that is what happened to us on the drive to Dillard, Georgia. We are just booking along, and all of a sudden Jamie spots a sign that says "Goats on the Roof" and he looks over and says "Hey! There really are goats on that roof!" So he whips a fast u-ie and we go back to take a look. We squealed up in front of a very unusual tourist trap and got out. First thing we noticed, yup...there were indeed goats on the roof of these buildings. We wandered around and found that the object of this unusual attraction was to do various things to send food to the goats. Peddle a bike, and a cup of food goes up to the goats. Turn a hand crank, and up goes a cup of food. Goats scurry from place to place, listening for their little bell to ring telling them when food is being dumped. Quirky as it sounds, it really was cute! Inside the building we found a very nice gem mining place, a candy shop, and an Amish country store with homemade jams and jellies. It was a lot of fun! We also went to Helen Georgia during our stay in the mountains and really enjoyed it there. Marissa had her name blown in glass and was proud to pay for it herself!!! We loved the toy shop with all handmade wooden toys adn of course...the candy shop! One of our favorite places in Helen is the Bear park. They have bears there that they have rescued from abusive situations and you can feed them apples and bread with peanut butter. The big grizzly will respond if you tell him to show you a trick, and he has quite an arsenal of cute moves to ensure that he racks up the yummies! Pictures from Apple Mountain Spring Break Trip! Our first stop on our Spring Break trip to North Georgia was Babyland General Hospital, home of the famous Cabbage Patch Hospital. We had been many times, but this was the first time Marissa had her OWN money to spend. She shopped wisely! This is our last visit to the hospital at it's original location on Underwood Street in Cleveland, a new and much larger hospital is scheduled to open this summer. The resort we stayed at had so much to do! We played Putt Putt, disc golf, board games, regular golf, pool, and Capture the Flag. Now this was Marissa's first time to play golf with her dad. They played 9 holes before she was worn out, and was only 5 strokes behind her daddy's score! On the driving range she hit a ball 85 yards!!!! We may have a golfer in the family! I will post again later with pictures from our outings and the other fun things we did. Have a great day! We are home from our trip to the beautiful mountains of North Georgia. We did all sorts of things....golf, mini golf, arcade games, disc golf, watched movies, played capture the flag, played board games, fed goats, went to a petting zoo farm, watched Muppet Movies, soaked in the hot tub, walked the streets of Helen, visited an actual surviving scrapbook shop (one of few I am sad to say), found a pair of Easter shoes for Marissa, played in the snow flurries and saw a lot of beautiful scenery in between it all. We are home now, after picking up Marissa's cousin in Atlanta. He will be here through the weekend and we have lots of fun things planned! I will post pics ASAP! Hope you all have a very blessed Easter Sunday!